This recipe tastes even better that the beautiful photograph can possibly show. Halibut is my all-time favorite seafood, but it’s the sauce that speaks to my soul here. Wow! More than enough sauce for 1 lb. of halibut, so invite company over and share the wealth. My only suggestion, for those who enjoy real kick, would be to add some pepper flakes…mayber 1/8-1/4 tsp. depending on how much one brain can handle. The sauce can certainly stand by itself so try it as is, and then make adjustments if you like. Break out a wonderful bottle of wine…perhaps one to consume while cooking, and yet another for when dining…this recipe is so worth the effort. 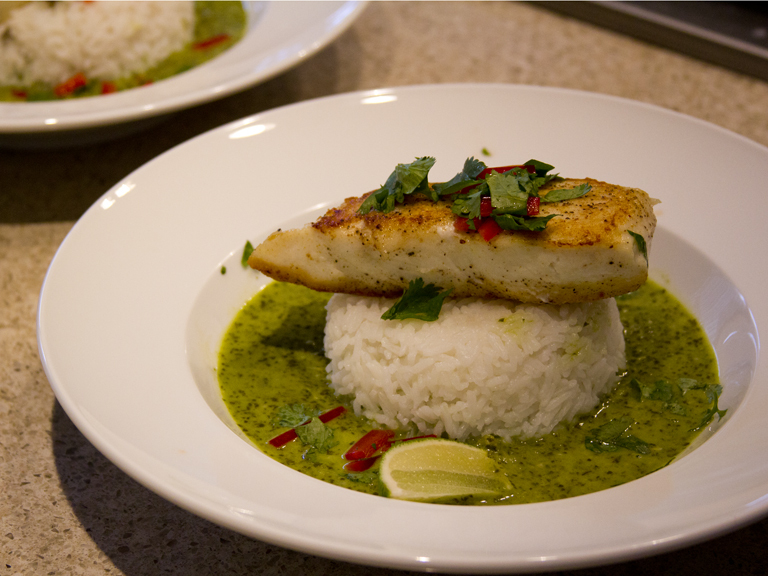 I served too much rice…and after we’d licked every speck of halibut and curry sauce off our plates, white rice was the only thing left!